The magical village of Oia, the second largest town on Santorini, lies at the northernmost tip of the island, clinging to the crest of a breathtaking precipice on the edge of the volcanic Caldera, directly overlooking the island of Thirassia, and approximately 12 kilometers north of Fira Town. 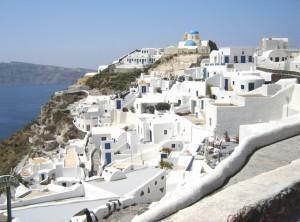 It is considered by many as having the most impressive view of any in the Mediterranean Sea. Its unique architecture, an issue of finding somehow and somewhere to build a set of homes clinging to the rock, results in a must-see village design. There is, in principle, only one main street, running along the Caldera, where all kinds of shops and tourist services are lined along both sides of it. A beautiful village offering drinking and dining facilities, shops, good public transport, and some excellent nearby attractions, this is a wonderful area to make as your base. There is a wide variety of accommodation here (a mixture of 19th Century mansions and beautiful Cycladic houses), as well as access to several beaches. Having a beverage at one of those tiny cafes set along the Caldera, enjoying the lovely ambience and the most dramatic sunset, the likes of which one could never imagine, turns your sunset drink into an experience that you will never forget. One of the finest collections of five-star luxury suites on Santorini, the Andronis also has a fantastic Spa menu offering individual treatments or a whole day's program of total pamering. This small, traditional settlement of guestrooms, apartments, and cave houses sits at the caldera's edge in the village of Oia, within easy walking distance of all of the village shops, restaurants and attractions.